The 2017 Toyota 86 and 2017 Subaru BRZ score 1-2 Best Sports Car in Kelly Blue Book’s 5-Year Cost to Own Awards. The Toyota 86 gets the top award in the Best Sports Car category and the 2017 Subaru BRZ sports coupe takes second place. The two sports cars were jointly developed by the Japanese automakers and are the most affordable sports cars on the market. Now KBB says the two sports coupes will depreciate less than any other sports cars. What do the awards mean for consumers? Consumers can expect lower costs in the first 5 years of owning a Toyota 86 and BRZ rear-drive coupe. This is based on analysis of Kelley Blue Book’s 5-Year Cost to Own information for 2017 model-year new vehicles. 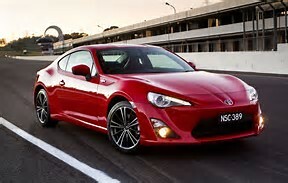 KBB says the Toyota 86 has 5-Year Cost to Own of $39,489 and BRZ has a 5-Year Cost to Own of $40,465. The 2017 Ford Mustang came in third with a 5-Year Cost to Own of $44,702. Toyota and Subaru’s goal was to create a sports car that was affordable and within reach of ordinary buyers. They succeeded in a big way as the BRZ has a starting MSRP of $25,495 and the Toyota 86: $26,255. Both models are powered by a 2.0-liter Subaru boxer engine that sits low in the chassis and gives the two-door coupe one of the lowest centers of gravity of any sports car. The rear-drive coupes are high on the fun-to-drive meter. Both are manufactured at Subaru’s Gunma plant. KBB says, “The 86 is a quick, lightweight and genuinely fun sports car that should make any driving enthusiast happy. It has a tossability that's rare in today's cars, and although it's not very fast, the taut suspension lets you carry speed into a corner unlike nearly anything at its price point." It wasn’t the only award for Subaru. The small Japanese automaker also scored the Best Brand for 5-Year Cost to Own Awards and the 2017 Crosstrek crossover wins in the Best Compact SUV/Crossover category. If you want an affordable sports car that will hold its value better than all others, the 2017 Toyota 86 and 2017 Subaru BRZ are good choices for driving enthusiasts.